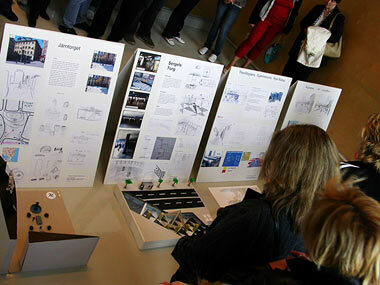 Partnership: The Swedish Museum of Architecture and Thorildsplan Upper Secondary School. Participants: 55 pupils (age 16-17), 2 teachers, 1 specialist of constructions of models, 1 architectural pedagogue. Roles: The teachers, pedagogue and specialist are supporting the pupils in their design-process and the process of gathering information. A pupil driven project. Goals/Aims: Rise awareness of space and the city. Methodology: Dialogue. Development driven by the need of the pupils. Guided tours. Making analysis of space. Model building. Oral presentations. The project started with a guided tour showing the development of the city to give a background to why the city looks the way it does. Then we focused of how to analyse a space by doing different kinds of sketches, making maps of the sound, smells, entrances, paths, feelings, dangers, light, etc. 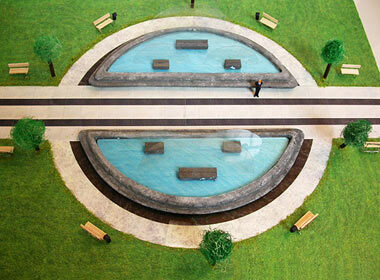 Thereafter the pupils (divided into groups of five) chose a space that they thought needed a change. There they did analyses on the space to find out the best way to change it. Through an introduction to how to construct models the pupils got familiar with the different materials they could use in the models. Each group then built a model of the chosen space to show how the redesigned space would look like and also a wallpaper to show their design process and the analyse of the space. The pupils made an oral presentation of their ideas and got feedback. Thereafter they got some time to do some changes to their presentation material. Finally there was an exhibition at the Swedish museum of Architecture where the pupils showed their work. Outcomes: The pupils saw the city with new eyes and became aware of that space and places in the city are created areas and therefore also can be changed through a democratic process. The collaboration between the school and the museum gave the pupils an opportunity to show their ideas to a wider public.